An excellent example of an iconic vehicle, this Lotus Esprit S4 represents the pinnacle of the development of a pure sports car. was at its unveiling at the 1975 Paris Auto Show. This extra clean example has always been stored indoors and has received the highest level of care that can be documented in the receipts going back to 2002. The engine was rebuilt in 2013 with upgraded JE Pistons, all new engine accessories, new crankshaft, valves, guides, etc. And exhaust manifold. More recent services have changed most of the fluids and a turbo rebuild. The car is in factory stock condition, has no know leaks or deferred maintenance. It has not been hot-rodded or abused. If you can find a better example at any price buy it! There are a few cars that are faster in a straight line but virtually none that corner like an Esprit. This car is an absolute blast to drive. 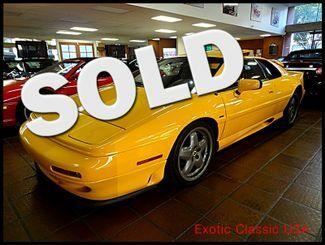 Visit https://en.wikipedia.org/wiki/Lotus_Esprit for the history of the Esprit. Looks, performance, condition and history, this car has it all.